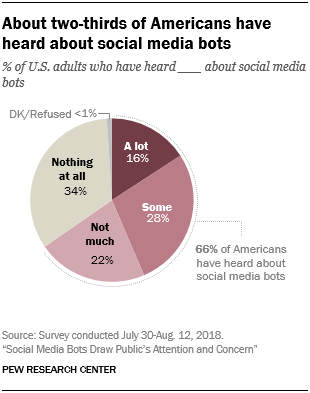 Amid the ongoing debate about the role of bots on social media, about two-thirds of Americans (66%) have heard at least something about social media bots – defined in this survey as accounts that operate “on their own, without human involvement, to post and do other activities on social media sites.” But very few pay close attention: Just 16% have heard a lot about social media bots. And roughly a third of the public (34%) has heard nothing at all about these types of accounts. While most Americans have heard about them, the debate about social media bots has not reached all corners of the public at the same rate. Younger Americans are much more likely than older adults to have heard about social media bots. About three-quarters of Americans ages 18 to 29 and 30 to 49 (78% and 76%, respectively) have heard of bots, compared with 58% of those ages 50 to 64 and about half of those 65 or older (49%). The same pattern holds when comparing how much they have heard, with younger Americans more likely than their elders to have heard a lot or some about bots. There are also differences in familiarity by education and, to a lesser extent, by party affiliation. About three-quarters of Americans with a college degree (78%) have heard of social media bots, compared with 55% of those with only a high school education. In addition, Democrats and Democratic-leaning independents are more likely than Republicans and Republican-leaning independents to have heard about social media bots (72% vs. 61%, respectively). Amid the larger debate about misinformation and bots on social media, the public largely views bots negatively. 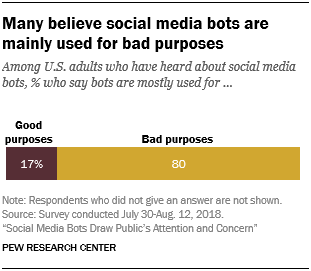 An overwhelming majority of those who have heard of bots (80%) say that these accounts are mostly used for bad purposes, while just 17% say that bots are mostly used for good purposes. This broad consensus is consistent across demographic groups. For instance, roughly eight-in-ten Republicans and Republican-leaning independents as well as Democrats and Democratic-leaning independents who have heard of bots suspect they are primarily used for malicious purposes (84% and 78%, respectively). Similarly, even though younger people are more likely to have heard of bots, there is broad agreement across age groups about their intended purpose: About eight-in-ten Americans in each age group who have heard about bots believe they are mostly used for malicious purposes. 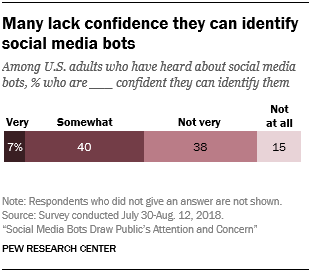 Not only does the public generally have a negative view of social media bots, but few Americans have a lot of confidence in their own ability to detect them. About half of those who have heard of bots (47%) are very or somewhat confident that they can recognize them, and just 7% are very confident. About four-in-ten (38%) are not very confident, and 15% say they are not at all confident. This stands in contrast to the confidence Americans had in their ability to detect made-up news: In a December 2016 survey, 84% of Americans were very or somewhat confident in their ability to recognize made-up news.